cleansing and clarifying: Cream of cucumber. Here are some soups and smoothies that Steph and I made yesterday for dinner. 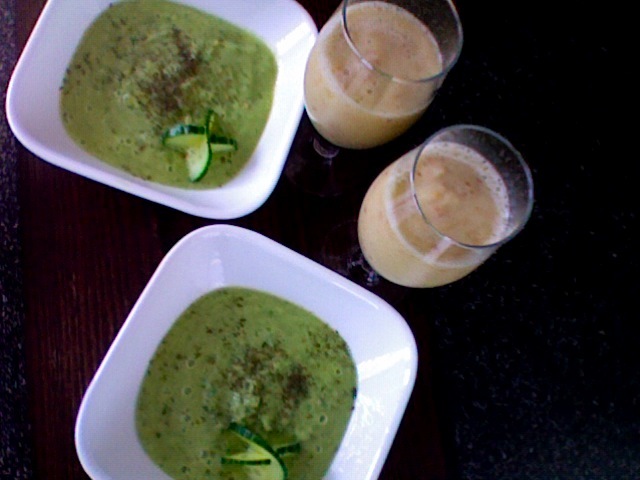 Cream of cucumber soups, and the smoothies are 2 frozen bananas with 1.5 apples or so. The smoothies were mind blowing, and freezing the bananas definitely helped because it made the smoothie so cool and creamy. The soups were so, so lovely. Steph put some dill juice in hers which made it super dilly, but mine was nice. It was a tiny bit thick, so it was nice to eat. Team work.